More than 100 people came to Charlottenburg on Saturday for a free, historical walking tour. Under overcast skies, they gathered in the central Berlin neighborhood for a unique visit: to mark the 80th anniversary of anti-Jewish Kristallnacht, or the “Night of Broken Glass,” pogrom -- the first coordinated, nation-wide attack on Jewish citizens under the Nazi regime. The damage done on that November night in 1938 went far beyond broken windows. Around the country, thousands of Jewish citizens were attacked, hundreds were murdered, and 7,500 Jewish shops and businesses were looted or destroyed. Also, 1,400 synagogues were burned. The state-driven anti-Semitism, which occurred five years after Adolf Hitler took power, set the stage for the Holocaust and marked a gruesome turning point in German history. Israeli tour guide Ben Fisher leads a historical tour commemorating Kristallnacht in Berlin. “This was a game-changer, because up until 1938 you could be a German Jew, seeing that things were becoming worse and worse, but you still held the belief that maybe the Nazi craziness would go away," the event’s organizer, Ben Fisher, told the group. "Or even if the Nazis would eventually deport you, they would do it in a legal fashion because this was Germany, after all." “On this tour, we are basically following the story of the persecution, the program itself, the damage to stores and the synagogue and the forced immigration that came in the next weeks and months,” he added. The tour wound its way through Charlottenburg, where in 1938 10 percent of the population was Jewish and much of the violence in Berlin took place. At the end of the tour, a small informal ceremony was held to commemorate victims of the Holocaust. Fisher is a charismatic Israeli history buff who moved to Berlin three years ago and now runs a private tour agency, “Ben in Berlin.” Feeling a personal need to commemorate the anniversary, he and a friend, Tal Grunspan, advertised the free event on Facebook, with the intention of guiding just a handful of friends and colleagues. He got more than he bargained for when dozens of people attended. 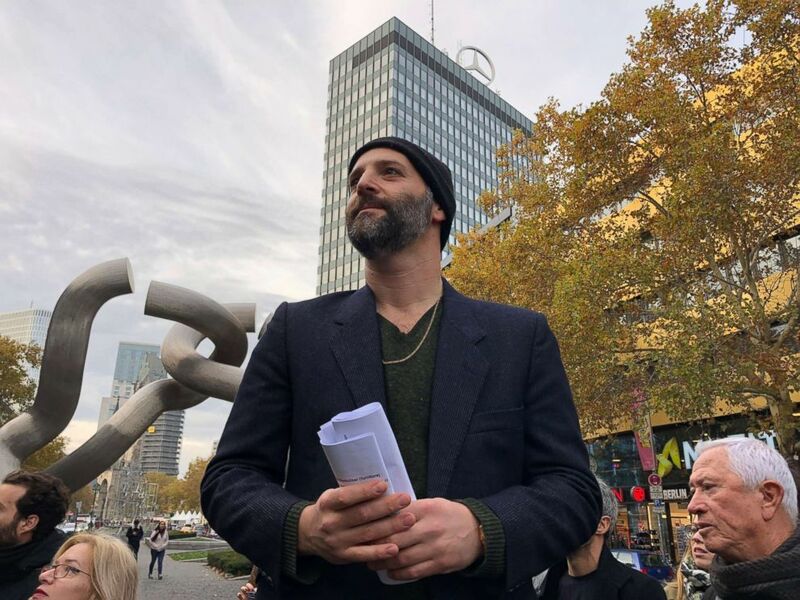 “It’s obvious there is some demand for this -- and maybe it’s a good way to approach younger people to talk about Jewish history of Berlin,” he told ABC News. With the far-right xenophobic riots that broke out in the eastern German town of Chemnitz in September still looming large in Germany’s societal conscience, it seems an apt time to remember Kristallnacht and “the events which led citizens to play out their long-standing resentments,” as Chancellor Angela Merkel said Friday in a ceremony at a Berlin synagogue. A stone arch, one of only two remains of the original architecture of the Fasanenstrasse synagogue decorates a Jewish Community Center in Fasanenstrasse street in Berlin, Nov. 7, 2018. The chancellor urged citizens to take initiative and set themselves “strongly against attacks on our open and plural society." "We are commemorating in the knowledge that watching as lines are crossed and crimes are committed ultimately means going along with them," she reminded the public. One of the most interesting stops on the tour was the Jewish community center, which stands in the place of the former Fasanenstrasse Synagogue. 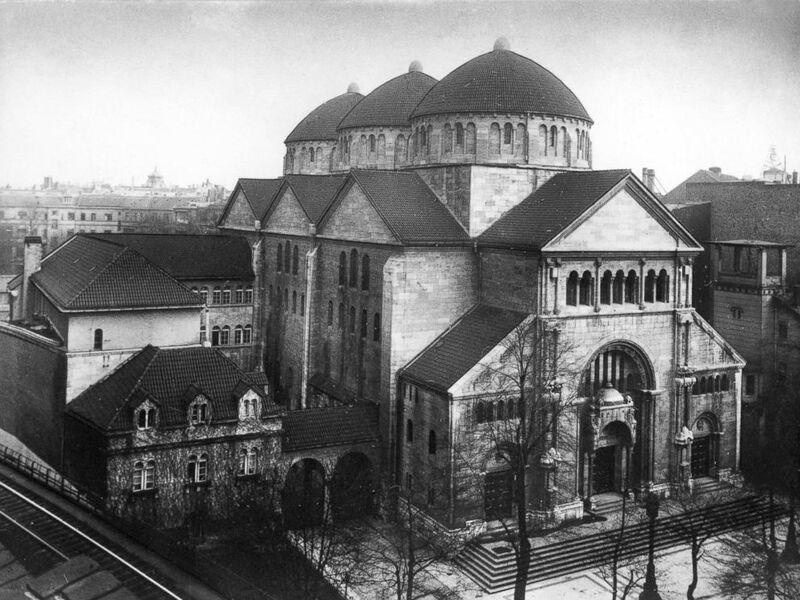 When it opened its doors in 1912, it was the largest synagogue in Berlin and a symbol of Jewish integration in German. It was so significant that Kaiser Wilhelm II, the former German emperor, made a visit. As such, it was a primary target of the November 1938 pogrom, with Joseph Goebbels sending a specific directive to Berlin to ensure that the synagogue be burned, Fisher told the group. The Fasanenstrasse synagogue, then Berlin's largest house of Jewish worship, is pictured circa 1930, eight years before it was burned by Nazis during Kristallnacht. Fisher showed a photo depicting firefighters standing next to the burning synagogue, not making any attempt to quell the flames. “They had an order coming from above that they should only intervene if the fires went to German, Aryan areas,” he told the group. 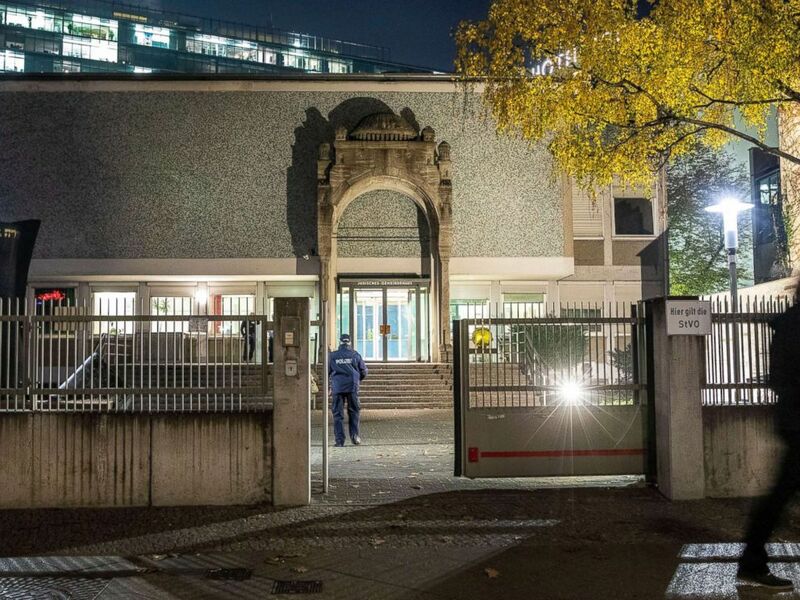 The Nazis had closed the synagogue in 1936; it was destroyed by an allied bomb in the 1940s and then re-opened in the late 1950s as a Jewish community center, which it remains today. Pieces of the original synagogue were incorporated into its facade. 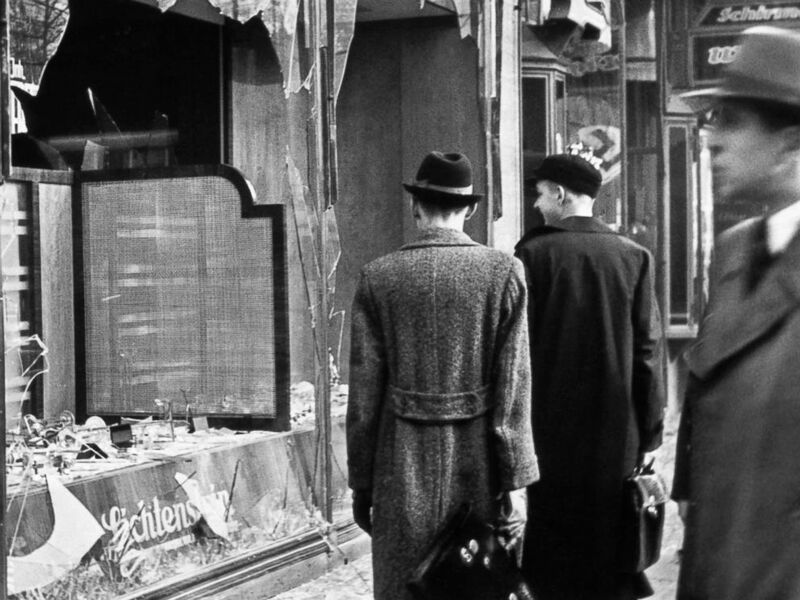 Pedestrians look at the broken windows of a Jewish-owned shop targeted by Nazis on the evening of Kristallnacht in Germany, 1938. Fisher considers himself well-informed on the history of Nazi Germany, but described the scope of the pogrom, which he discovered while pouring over archival materials in the library, as “mind-blowing." Walking down the busy shopping street Kurfuerstendamm, Fisher pointed out the striking juxtaposition of past and present. “You can go now to Kurfuerstendamm and show a picture and say, 'Listen, there was a store here. It was plundered. You can see the merchandise on the sidewalk and people are taking what they want,” Fisher said. “It’s a strong dissonance when you see today. It’s a UNIQLO," he added. "But this is part of Berlin’s history –- it suffered so much and keeps rebuilding itself."